Stitch a shawl in a weekend! 2 beautiful designs are included in this pattern. Each uses Bernat Vickie Howell Sheep(ish) worsted-weight yarn. Lacy Reader's Wrap is 16"W x 60"L; Prayer Shawl is 11"W x 66"L. Skill Level: Easy. 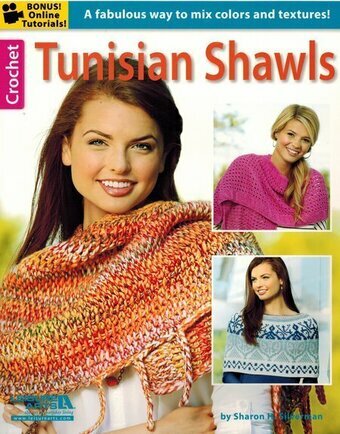 In Shawls You'll Love from Leisure Arts, beautiful stitch patterns make 13 shawls great additions to your wardrobe or wonderful choices for prayer shawl ministries or friendship gifts. Whether you prefer casual, comfy wraps or styles with timeless elegance, you'll find the perfect design in this collection! Each pattern echoes from the center to create matching ends or top and bottom edges. They're all easy to crochet using medium weight yarn, and our free online technique videos offer extra support. 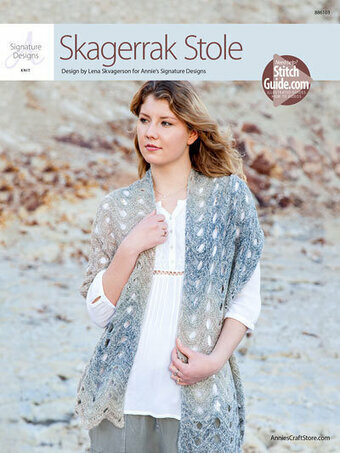 Designs by Judith A. Thompson and Carla Rae Miller include Oriental Lace, Bliss, Carefree, Daydream, Dancing Diamonds, Chevron Embrace, Masterpiece, Grace, Harmony, Fantasy, Camelot, Compelling, and Striking. Beautiful designs made using Red Hearts Shawl-in-a-ball worsted-weight yarn. Size: Stole - 19 1/2"W x 63"L; Shawl - 75"W x 33"L; Scarf - 12"W x 66"L. Designs are made using a size H/5mm crochet hook. Stole uses 2 balls of #204 healing teal; Shawl uses 2 balls of #207 feng shui grey and scarf uses ball of #205 soothing blue. Skill Level: Intermediate. 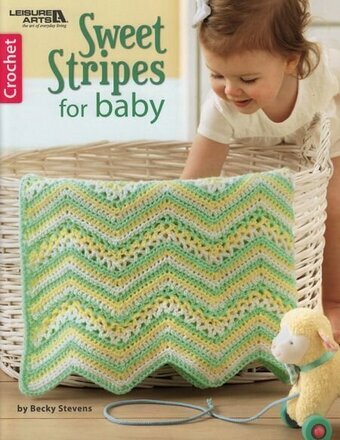 Catch the chevron craze with the easy fashions and afghans in Cozy Ripples for You and Your Home, featuring Homespun and Homespun Thick & Quick from Lion Brand Yarn Company. Lovely, lofty and quick to knit or crochet, Homespun is available in dozens of beautifully blended colorways, from heathery tweeds to painterly palettes, making even the simplest of projects look stunning. Super-bulky Homespun Thick & Quick features heathers and slowly striping painterly shades, so you can easily find the color you love. Projects include Breezy Blue Shawl, Hearthside Ripple Afghan, Cozy Ripple Poncho, Graphic Ripple Afghan, Ripple Mitts, Refreshing Ripple Afghan, Bobble Ripple Cowl, Eyelet Ripple Afghan, Ripple Triangle Afghan, and Buttoned Wrap. 48 pages. Dreamy-soft and so very stylish, this collection of five feminine shawls and a fashionable shrug will warm up your wardrobe! With six lovely designs from which to choose, you'll have the just-right wrap ready to go at a moment's notice. Crochet them in colors to complement your favorite outfits, and be sure to make one or two extra for a friend or family member. 6 easy and intermediate projects to crochet using bulky or medium weight yarn: Shell Shawl, Lacy Shawl, Motif Shawl, Striped Shawl, Broomstick Lace Shawl, and Shrug. These warm-weather accessories are so soft and light, you'll almost forget you're wearing them. 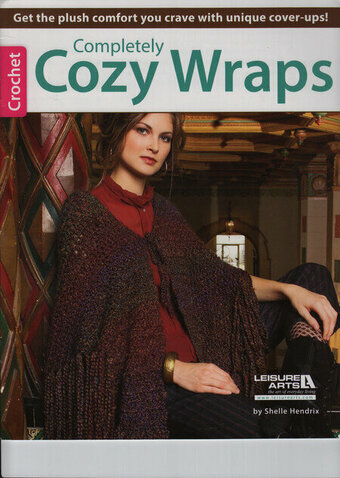 All four designs - three lacy short ponchos and a triangular shawl - were crocheted with satiny yarns. The ponchos are each worked in one piece circularly from the top down. Stapled; 8 pages.